Curtain Wall and Window Wall: What’s the difference? While most of the room gives them the “that’s a dumb question look,” the reality is they are all thinking the same thing. After all, the most general definition of a curtain wall system is, “an outer covering of a building in which the outer walls are non-structural.” The wall itself can be comprised of brick, glass, or any other material. For the sake of this article, we will focus on curtain wall as it relates to glass, and try to provide a basic overview of curtain wall and window wall systems. Truthfully, even the glass and glazing industry doesn’t always see eye to eye on categorically defining the two systems. There are very distinct projects and applications when one system is preferred over the other, yet sometimes they are interchangeable. Many different factors need to be considered, and only after having a full understanding of a project’s goals and design intent can one decide which system is best suited for a particular project. Since this topic does come up often, we wanted to provide some guidance on how we at Kovach view the two solutions. Our intention with this article is not to provide a complete dissertation on fenestration systems, but rather provide some high-level awareness about window wall and curtain wall so that you can be more informed on your next project. Generally speaking, curtain wall attaches to the outside of the floor slabs, acting as a “curtain” that is literally hung on the building and therefore, non-load bearing. It spans slab to slab, and systems are most often constructed in one of two ways; stick-built or panelized. With stick-built curtain wall, components are sent directly to the job site where they are assembled in the field before they can be installed. Panelized curtain wall is made up of prefabricated units built in a controlled shop environment. The units are sent to the field ready to be anchored at the floor slabs. Curtain wall systems come in standard depths of 6 – 10 inches and can go deeper depending on manufacturers capabilities. Deeper systems provide more support without the need steel reinforcement. Curtain wall systems are the ideal choice when the distance between slabs exceeds 15 feet. Kovach has installed curtain wall systems up to 24 feet in height. In either stick built or unitized systems, curtain wall provides superior structural strength. The entire fenestration system essentially “locks” together providing excellent protection against high wind loads and earthquakes. Due to the great structural strength, curtain wall can handle larger glass sizes than window wall. Since curtain wall is attached from the outside of a building, small cranes and boom lifts – most often provided by the installer – are typically required for installation. Panels can be hoisted from the ground or from the floor on which they will be installed. There are many specific reasons to select a curtain wall system, and perhaps most obvious is the ability to produce certain aesthetics. Since curtain wall is attached to the exterior slab of a building, you can achieve a continuous “curtain” of glass on the exterior facade. Another reason unitized curtain wall is selected is that quality can be controlled at very high rate of success since the panels are built in a controlled shop environment. At Kovach, each panel is inspected and must meet the standards outlined in an extensive checklist that we have developed to provide consistent quality control. 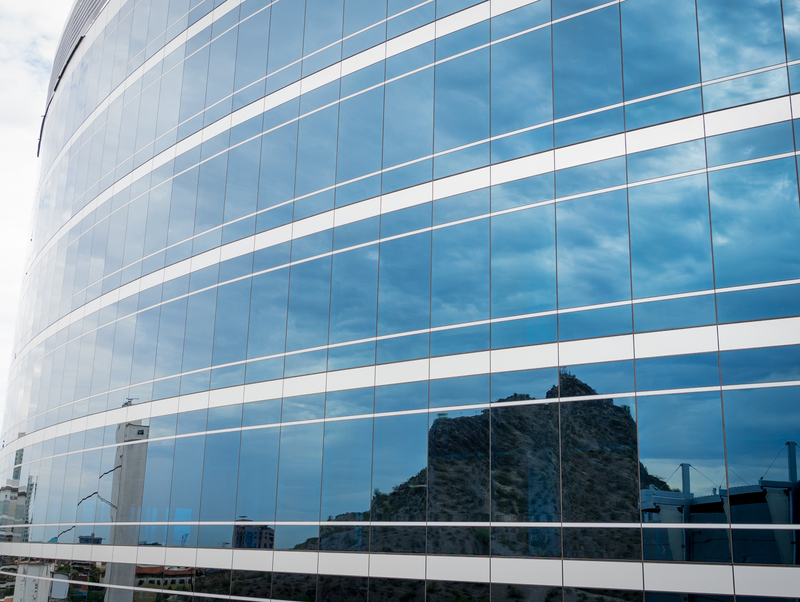 There are some common challenges associated with curtain wall systems. Since curtain wall sits outside the slab edge, it creates a void from floor to floor. This void requires the inclusion of fire-stopping. Additionally, noise transmittance can be a concern. However, there are high quality options available to significantly reduce noise transmittance levels for curtain wall systems. Curtain wall can be a costlier option than window wall, although there are other factors that need to be considered. Curtain wall is highly durable and does not require a lot of long term maintenance. In addition, since unitized curtain wall systems are fabricated in a controlled shop environment, fewer man hours in the field are required which helps achieve more stringent schedules. The savings associated with labor efficiencies in the shop and field often dispel budget concerns when it comes to evaluating the cost of unitized curtain wall compared with other systems. Unlike curtain wall, window wall sits between the floor slabs. Like unitized curtain wall, window wall is also built in a shop and shipped to the site pre-assembled. Units are anchored at the head and sill and sealed in place using caulking. Window wall is also non-load bearing. Since window wall sits between floor slabs, fire-stopping is not necessary. This also means noise transmittance can be less of a concern than with curtain wall in specific instances. On its own, window wall can typically span a floor to floor space of up to 12 feet. Beyond that, the vertical mullions will need to be loaded with steel to increase structural strength. Installation of window wall can be done from the exterior or interior and really depends on demands of the project. Aesthetics of window wall differ greatly from curtain wall. Architects need to consider how the exposed slab edge will be addressed in the design stage of a project. There are some very creative ways to work metal panels into the facade to cover the slab edge and integrate into the window wall system. There are some window wall systems that can replicate curtain wall on a small sale, but nothing comes close to achieving the same continuous look as a curtain wall system on large scale facades. Depending on the design intent, window wall may not be an option. For example, if your project is a 40+ story building and you want a continuous exterior glass facade, window wall is not the best choice. It does not have the structural strength and integrity of curtain wall, so the height of each project is a major consideration when looking at both systems. In terms of cost per square foot, window wall is generally less expensive than curtain wall, although the cost of managing the exposed slab edge needs to be considered. Window wall also has a high quantity of caulk of joints which can lead to long term maintenance expenses. Making a decision between curtain wall and window wall can be tricky due to the many variables that should be considered. There is a lot to take into consideration when selecting a glazing system, and the right solution could shift based on changes to your project. If your team is looking for some feedback while searching for the best glazing solution for your project, please feel free to reach out to us for assistance. Our experienced team is always happy to help! Since we design, fabricate, and install both systems, we are impartial to either solution, and will gladly help you determine what is best for your project.